Many children in India nowadays are unable to study because various reasons in particular poverty. Even though they try to join in government schools nearby their residence, lack of teachers in government schools obstruct their way towards education. 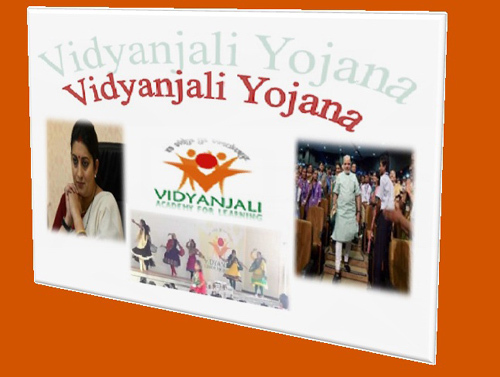 The Ministry of Human Resource Development has formulated and launched the program Vidyanjali Yojana Scheme. This program is designed to overcome all problems associated with children’s education in the government schools of India. 2 Aim of launching Vidyanjali Yojana The main objective of introducing this vidyanjali yojana scheme is to get volunteer teachers for government schools across the nation, by doing so it will helps to boost students to perform better in their educations. 5 Who are all can join as volunteer teachers in government schools under this vidyanjali Yojana? Any Indian citizen can be volunteer teacher in government schools, in fact one don’t need to be a graduate for becoming volunteer teacher. All they need to visit mygov.in and register themselves in Vidyanjali Scheme. The main objective of this program is to make use of contribution from people who have the desire to teach children in government schools. The best in class educational services from home makers, retired government employees, professionals in any sector, and members of Indian Diaspora and their children will make every child in government school educated. Vidyanjali Yojana is volunteer based program designed for using the community power in the school education sector. There is no formal educational qualification required for volunteers of this unique program. Deserving and willing staff in government schools will support every student becomes educated. Once individuals have decided to join in this volunteer program after they have read criteria specified by the government for joining in this program, they can listen to the following detail. This application form requires personal details and details about the nearest school where volunteers required. The Block Education Officer (BEO) has the complete responsibility to appraise each application for the Vidyanjali Yojana. Once the BEO has consulted with the head teacher of the school where the volunteer wish to teach, the BEO approves the application of the volunteer. Keep in mind that head master of the school has to accept the volunteer’s application. Volunteers have to provide their services in a particular school for 2 weeks. They do not have to visit their school every day and provide their educational services for 2 weeks. This is because they can do their educational service one day per week for 12 weeks. If the volunteer has completed this period, he or she can apply for extension of the volunteer service as they did for the first time. Vidyanjali Yojana is not designed for replacing qualified and regular teachers in government schools. The overall responsibility of every volunteer in this program is to provide the best education for every child in the government school. Who will be Vidyanjali Yojana Volunteers? Everyone with a desire to become an active volunteer for educating children in government schools can join in the Vidyanjali Yojana. They can qualify for this unique volunteer program and fulfil their desire about educational support for children in government schools. There are no strict eligibility criteria for people who like to join in the Vidyanjali Yojana. On the other hand, the government seeks volunteers who have enough knowledge in a particular subject they wish to teach children in government schools. Home makers with high school certification can be eligible for Vidyanjali Yojana. Everyone from Indian Diaspora category with Class 12 certification is qualified for Vidyanjali Yojana. Retired government or working self employed professionals with a degree certificate can join in the Vidyanjali Yojana without obstacles. NRIs with OCI Card can become volunteers of Vidyanjali Yojana program. There are many benefits from the Vidyanjali Yojana. For example, the following benefits will make this unique volunteer program successful. This ideal platform joins both those who are willing to give unpaid educational services and children who suffer from lack of staff for educating them in government schools. This program gives a simple yet an effective step to make the upcoming Indian Society as knowledgeable as possible. This program assists people who seek how to teach in government schools voluntarily and officially. Vidyanjali Yojana can be implemented successfully when every resident of India understands the overall benefits from this unique program. The government and potential volunteers of this program have to promote it by using media. The government has the responsibility to appoint qualified people for monitoring The Block Office that processes the application from volunteers. Once the cut-off date for successful implementation of this program is announced and overall efforts of everyone associated with this program have enhanced, Vidyanjali Yojana would give the best support for our upcoming society.